I guess I’d better say a few words about Wholly Genes’ The Master Genealogist, version 8, now. It has been a while since I wrote about the public beta release, so here are a few words about the final [sic] release. Since Wholly Genes released their still-buggy TMG Version 8 in December, things have gotten a lot more interesting on the home front. I am still occupied with cleaning up and fixing the output from Version 7 documents, so have not really tried the new features other than to compare them to the old. The major change for me was the Windows 7 printing capability. It works, to a degree. I cannot open a MS Word-format document in OpenOffice.org Writer without crashing it. Instead, I have to use RTF (Rich Text Format) output. There is not a whole lot of difference between the output required, and RTF is more common than Word 97, so it is satisfactory. One other thing that particularly irks me about the reports is the changes Wholly Genes made to the Journal report. Although it is adequate to the format, the output needs extensive fixes to conform to either the NEHGS or the NGSQ Register style. In particular, I am not very happy with the forced use of “ibid” in footnotes. This problem does not occur with endnotes, which are “uniqued” for the style now. Yuck! Even more reason to write your own reports with data extracted in raw form from TMG. I am still particularly interested in the GEDCOM import/export issues with TMG versions 7 and 8. They both continue to have numerous flaws. I tried the export in TMG 8 with the option for all tags and not all tags were exported. This is a serious flaw, especially for someone who might not examine the output before sending it off to a correspondent. I need to export a number of major projects for backup and further processing in other applications, and this is impossible to do. To quote from my review of the public beta: “TMG’s deliberately removing a researcher’s work from public sharing or even for private backup is a grievous mistake that could have legal and ethical consequences …”. Again, as I wrote in the public beta review “the rest of the changes are minor and more appropriate for a minor number release, say 7.5.” Tamura Jones also wrote a review of the beta version. His review is an excellent portrayal of the rest of TMG’s faults, and any potential user should read it. While it is nice to use TMG 8 on a Windows 7 machine, I will be sticking with TMG 7 on Windows XP in a virtual machine for a while. I will use version 7 until Wholly Genes fixes a bunch more bugs and gets version 8 stable enough for full release status. Finally, by the time 2015 rolls around (the year Microsoft ends support for the TMG database backend), I’ll probably have my own genealogy application up and running with a full data set extracted from TMG, in complete form. So, until then, we’ll keep struggling with the best and worst of the genealogy applications on the market: The Master Genealogist. Producing a report, an article, or a book calls for fitting the text into the available space in a pleasing way. The different formats require different typefaces and styles. Making the different requirements for each work together on the page is where page layout, or formatting, is crucial. Titles, headings, and body text are ideally set in different point sizes. These parts of a report have different requirements of their own; using styles makes them easier to handle (Styles will be covered in a later post). The most common page size in the United States is 8.5″ × 11″. 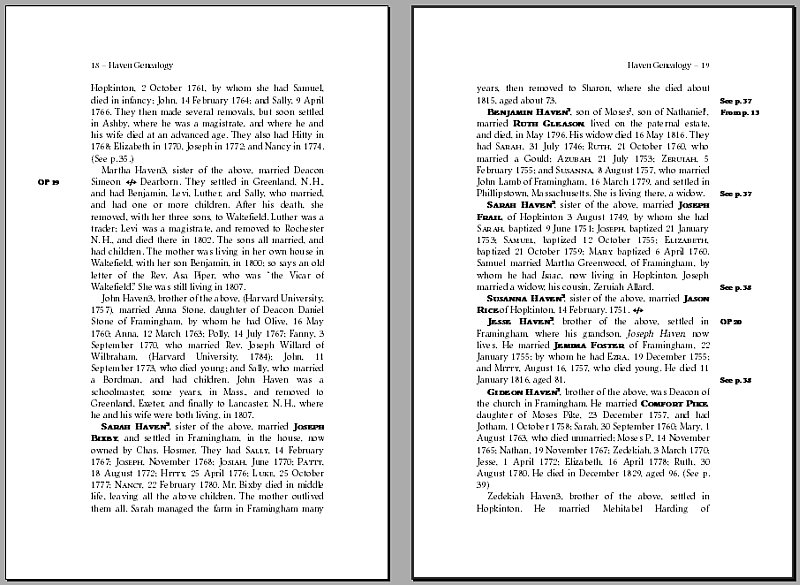 A common size for printed genealogy books is 6″ × 9″. The latter size is also used as the size of many larger paperback novels, or non-fiction books. To keep things simple for this series, I’ll use the larger, more common size, as examples. European readers can easily adapt the mathematics to the ISO page sizes A4 and A5, for instance. The primary feature of most genealogical writing, is body text; The first thing you should consider is the ideal line length, which is 40 to 60 characters. Basing your text block margins on this measure is as easy as multiplying the point size by two, multiplying the result by 12, and setting the margins to that measurement. There are 72 points to the inch and one pica equals 12 points. Thus, for 11-point type, the optimal line length is 264 = (11 × 2) × 12, or 3.66″. On an 8.5″ × 11″ page, an ideal line length for 11-point type is 3.5″ (252 points), with left and right margins of 2.5″. One example is shown in the illustration. It is a basic one-column setup with running headers and folios. The text shown is of a reprint for Josiah Adams’ Haven genealogy, originally printed in 1843, reprinted as a new edition in 1847, and as a revised, combined edition in progress with me. The page layout shows ample margins which enable the owner to add notes and corrections. It also allows the publisher to move inset references to other parts of the book into the margins. The reference in the left-hand page margin, and one on the right-hand page are markers for original page numbers in the 1843 edition. 2- and 3-column layouts can be adapted from the measurements above, giving more text on the larger sizes of paper; for instance in a newsletter, or two-column society bulletin. The multiple column formats also allow larger type sizes, rather than smaller, as the text is infinitely easier to read that way. The trade-off becomes more or fewer pages. In the typography field, headers and footers are called running heads or footers. In most layout and word processing programs, they are simply called headers and footers, so I’ll use those terms. The contents of these two items are sometimes controversial. Authors and publishers debate whether the title of the book, or the author’s name should be included in the verso header, and which subhead(s) should be included in the recto header. In genealogical works, the left, or verso, or even-numbered pages, commonly have the title of the book. On the recto, or right, or odd-numbered pages, the chapter title or generation number is given. On all but the first page of a chapter or major section a folio, or page number, is also given. Folios should always appear at the outer margin of the text block. Most genealogies have the page number in the running head, although some use the running footer for the folio. A few large reference books use the outer margin, beside the text block for page numbers, although putting the number in this space can cause it to be obscured by marginalia. With 11/13 as the basic line measure (11-point type on a 13-point line spacing), I’d have a 14-point heading on a 16-point line-spacing (14/16). For a blank-line space we’d add 12 points above the paragraph and 6 points below. The next-higher heading would be 16-point on 18-point (16/18), and so on. A half line-space (six points) line below the heading separates the heading from the body text following it. In OpenOffice.org Writer, my preferred word processor, I need to put a non-breaking space after the footnote character. The effect otherwise would cause the number to run up against the text, which is unwanted. In Microsoft Word 2010 this is not a problem. I use the ASCII 0160 character (generally entered using by turning on the numeric keypad and pressing the Alt key and then the four digits. Alternatively, in Windows, you can use the Character Map applet and copy the character from there, into the space for it on OOo Writer’s footnote configuration screen. Having the hard space after the footnote character is advisable if you are using justified text. If the non-breaking space is not there, there may be a larger gap between the character and the beginning of the note than is desirable, making the left part of the page more ragged than it ought to be. Apparently this is NaBloPoMo, or in English, “National Blog Post Month,” so I’m going to not quite participate, but encourage others to at least post some. One, “Stanczyk – Internet Muse,” has recent, and interesting, op-ed piece about Ancestry.com. The Stanczyk blog I read pretty much weekly because the writer has interesting materials and things to say way outside of my own research interests. Another, “Potato Roots,” has such an interesting name that I shared a comment with it’s owner. WordPress.com encourages responsible and reasonably accurate blogging. It also enforces a good no-ads policy. A couple of tools I especially like on WordPress.com are the Zemanta content suggestion feature and the After-the-Deadline spelling and grammar checking feature. The Zemanta feature is a huge collection of material from your own and others’ blogs and websites that can be re-used without fear of copyright infringement. It can suggest images from a bunch of popular sites, including Flickr, Picasa, Wikipedia, and other Creative Commons-oriented repositories. The After-the-Deadline tool takes your text and runs it through a well-maintained dictionary, thesaurus, and grammar checking tool and offers up corrections and improvements to better match online reading habits and writing styles. While the A-t-D extension doesn’t work on the scale of the tools in a regular word processor like OpenOffice.org Writer, it is a good final check to help you look better online. These two tools, Zemanta, and A-t-D, are also available as Chrome and Firefox extensions, so they are useful even if you don’t use the best integrated blogging platform. The A-t-D extension even works on regular websites and social media spots like Google Plus. Another feature I really like on WordPress is it’s media library. No more flipping about in Google Docs for links and sharing permissions and posting those links into your Blogger blog. Yuck! In the WP dashboard, a well-designed cockpit, you can upload and manage materials sharable by the blog as a whole or on a post-by-post basis. Each entry for the media items shows which part of the blog it is attached to, so you can find things easily. While WordPress blogging won’t make you a better genealogist, it will make what genealogy stuff you post look better. Hoping to see more genealogy blogs on WP, soon. The John Bent family sketch (John¹ Bent Descendents) is something I put together last year, so it might be a bit out of date. It’s an example of the NEHGS Register style, and has one unique feature. The footnotes in this style are bracketed. Making the line breaks work with this style, so that the footnotes stay where they belong, can be tricky. In my favorite word-processor, OpenOffice.org Writer, I need to put a non-breaking space between the text and the footnote, select it, and open the character formatting dialog to hide the hard space character. With Microsoft Word (2010), you’d use the Font dialog and choose Hidden from the Effects section. The sketch is also set up in the NEHGS Register style, a bit different from, and IMHO, better than the one available from their website. I’ll e-mail a copy of this sketch in Word 97-2000 format or OOo ODT format on request. The e-mail address is at the end of the sketch. This sketch is set up as a 6ʺ × 9ʺ page, designed for printing front-to-back so we can save paper.